Buried in the pages of the first issue of Young Avengers by McKelvie and Gillen is something you may not have noticed. This is an event that was never truly highlighted or underlined in the Marvel Universe but still incredibly important. 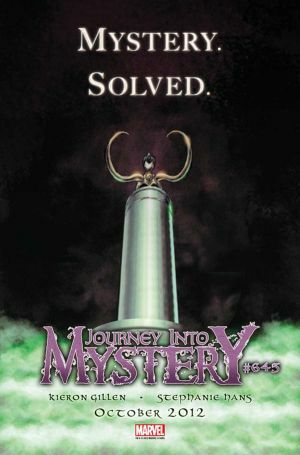 The secret had been ruminating for an incredible 23 issues under the pen of Kieron Gillen in Journey Into Mystery. The following is a massive spoiler for those wonderful 23 issues and an incentive to read Young Avengers #1. Has anybody ever heard of that little comic book called The Amazing Spider-Man 700? Has anybody taken a look at many of the mixed reviews the title received? Gillen’s last issue of Journey Into Mystery has the same plot points of Spider-Man 700 but takes itself incredibly seriously. A main character is swapped the brain of his evil adversary. In this case Young Loki introduced a few years ago post siege is horrible killed by the Old Loki we all love to hate. This was hard to stomach because Stephanie Hans drew it and nailed the moment making it so serious and heartfelt. Making me feel what Young Loki felt. The writing was also incredibly (dare I say it) superior and showed the true potential of taking someone like Loki killing him and making you suddenly care out of nowhere. To summarize this the secret of Young Avengers is that young nice Loki is dead and that Loki on the page is Evil! Thinking about this in detail causes other questions to bubble to the surface. Why was there no mention of evil Loki in Young Avengers #1? Is Kieron Gillen hiding it from the audience who hasn’t read Journey Into Mystery? What are evil Loki’s intentions for starting a team like this? What is Loki really up too? All these are reasons why every human on earth should be reading the new volume of Young Avengers. As if the fact that Kieron Gillen and Jamie McKelvie writing and drawing the new book was not enough. Loki is dead long live Loki!